thebahamasweekly.com - Birding at Grand Bahama's "Delightful Dump"
Birding at Grand Bahama's "Delightful Dump"
One of Grand Bahama's productive birding sites is the local landfill, operated by Sanitation Services. Lou Carroll, the General Manager who loves birds, and Jason Albury, the Landfill Manager, make sure that their heavy collection trucks and other machinery avoid the wetland patches created by rain, that provide food and habitat for the resident and migratory bird species! As the matter of fact when you look at the photos of the birds and their environment you may think that you are in a national park rather than at the dump! 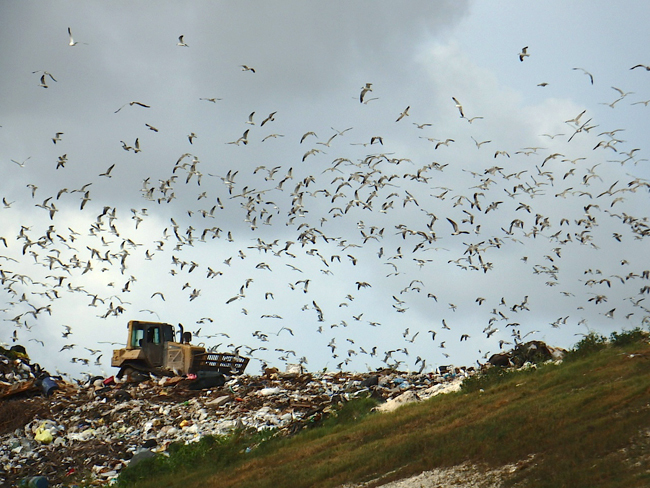 Of course one of the most abundant species that you can find at most landfills is the Laughing Gull, a resident of the Bahamas. These birds surround the tractors which distribute delectable edibles for them. When you look up along the high elevation created by years of garbage and now covered by grasses, you feel that you might be somewhere in the South American foothills where cattle is followed by large flocks of Cattle Egrets which are feeding on the insects and small animals stirred up by the grazing herd. 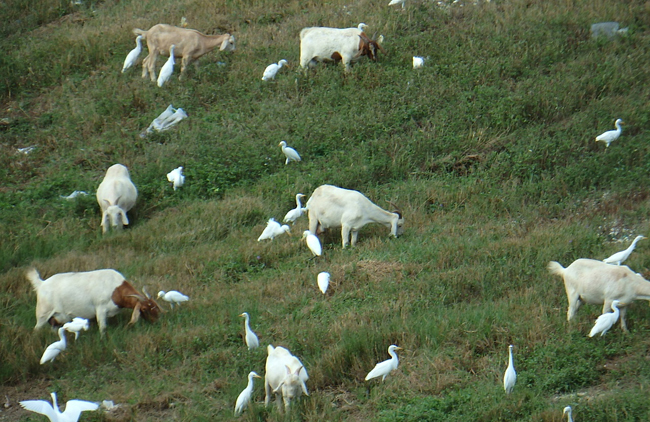 Here, at the landfill's grassy slopes you will find a substantial herd of resident grazing goats surrounded by the migratory Cattle Egrets snapping up their meals! Moving from the "mountain" over to one of the larger ponds I noticed a flock of 15 migratory Glossy Ibis that where probing the muddy pond bottom with their extensive, curved bills. They were watched over by a motionless juvenile resident Black-crowned Nightheron (below, top left) perched on a rock amidst them. He seemed annoyed at the early morning disturbance by this flock as he probably intended to begin his daytime rest (after all he is a night heron!) Further along, a little patch of water was perfectly suited for several migratory Least Sandpipers (below, bottom right) as they could forage to their heart's content without being disturbed by the larger birds. I noticed several Barn Swallows (below, middle far right) above another body of water and I admired their agility in flight as they darted after insects with their pointed wings and long forked tails. When I scanned the edge of the water I watched a Solitary Sandpiper with its unmistakable white eyerings and small white spots on its wings probing the water for delicacies. Having a great day so far, hoever, the highlights of my birding morning at the landfill were yet to come! I was glad that management does not allow their heavy equipment to venture off the designated roads, because right in the middle of a gravel patch near one of the ponds sat a Killdeer (center below) incubating eggs in a shallow nest of pebbles and twigs, called a "scrape". Killdeers are in the Plover family and look very distinctive with their black double breastbands. They are resident species and raise their families here. 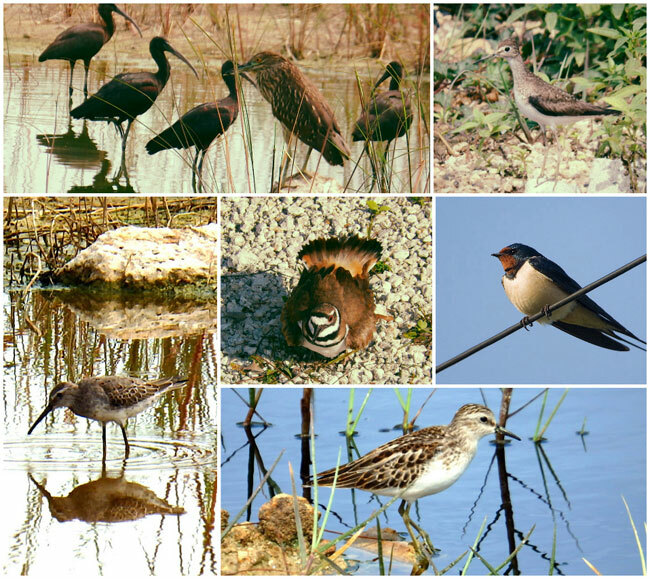 My last bird for the morning was a "lifer" meaning a bird I had never seen before which made it a new addition to my birding lifelist - a Stilt Sandpiper (below, bottom left), quite rare for Grand Bahama! This bird was constantly feeding with its head under the surface and I was lucky to get one photo where it briefly seemed to "catch it's breath" and pose! The "Stilts", true to their name, have long legs. In the summer they breed in Canada's Northern Territories up to the Arctic Circle, then migrate through the islands in the fall on their way to their wintering grounds in South America. I had been lucky to have been at this place at just the right time that morning!